When you were learning to drive, your dad probably told you not rev the snot out of his car, and that’s pretty good advice for your typical passenger car with a slush-o-matic transmission and stock everything. Good advice not withstanding, back in the day, on a hot summer evening, you could hear the bad boys downtown revving the snot out of somebody’s car, burning the tires off, and getting chased by the cops. Good times. Fast forward to today, and think motorcycles. It appears that an awful lot of people took the old man’s warnings to heart. They call it “babying” and think they’re doing their engine a favor. However, the Tech department here at S&S reports that they have far more calls about engines failing due to lugging than having the snot revved out of them. This situation has undoubtedly been exacerbated by the taller gear ratios and 6-speed transmissions in the later model bikes. Heavy vehicles, like baggers pulling trailers and trikes, are the most likely to have problems. Consider this scenario. A guy, or gal (let’s share the blame here) is cruising down the road at 55 mph in 6th gear and the engine is turning a little over 2000 rpm. When he or she needs to pass a car or go up a hill, he or she just opens the throttle and goes. This is actually worse than winding it up, and he or she could be hurting his or her motor. They could actually be killing it with kindness. Here’s why lugging an engine causes problems. If you’re traveling in high gear, at a fairly low rpm, the BMEP (Brake Mean Effective Pressure) in the combustion chamber is going to be higher than if you shifted to a lower gear and increased the rpm. In the higher gear, you have to give it a little more gas to make it go. That’s because it takes more force to turn the rear wheel, and since there are fewer combustion events doing the work, each combustion event has to release more energy. The resulting temperatures and pressures are proportionately higher. The good news is that you might get better gas mileage because the combustion is more efficient. The bad news is that if you “lug” the engine to a sufficiently low RPM these temperatures and pressures will become destructive. It can turn ugly, and it’s pretty unlikely that you can save enough on gas to pay for a top end rebuild, or worse. When combustion chamber pressure and temperature get high enough, knock, detonation, and pre-ignition will occur. If you let that go on for any length of time, it will destroy your pistons. It’s pretty easy to tell if an engine has been lugged. 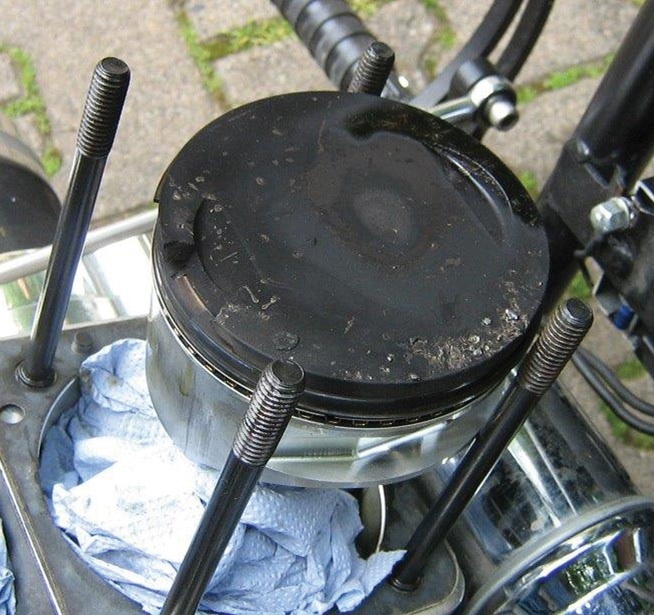 The top ring land of the piston gets really hot and small amounts of fuel detonating beneath it tend to push it up. 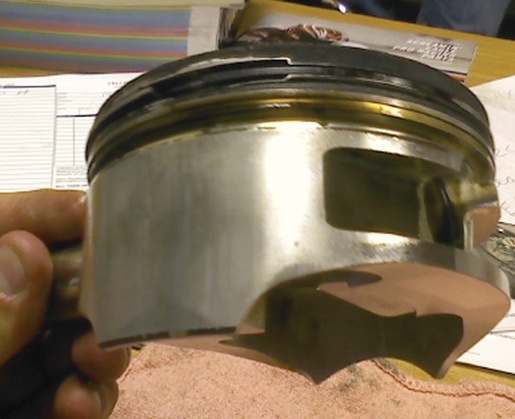 In moderate cases, it looks like the piston is smiling – the beginning of the end. In more advanced cases, a piece of the ring land has broken off and very quickly trashed all sorts of things in the combustion chamber – the end. So how do we avoid burning down our engines? It’s really simple. Shift down when you need to. If you feel the engine chugging or jerking, or if you can hear the sharp metallic clicking of detonation, do not let it continue! Get out of the throttle or shift down to a lower gear. We recommend that you keep your rpm around 2800-3000 at highway speed. If that means you don’t use 6th gear on secondary roads, that’s OK. S&S is located in the driftless area of Southwest Wisconsin and the roads are hilly and curvy. We don’t find 6th gear very useful here most of the time. We reserve it for going down hills or the interstate where we can click it into 6th and keep the rpm up around 3000 at cruising speed. At a moderate, but higher rpm, you have the following advantages. Lower gears put less strain on the engine. The work of moving your bike down the road is divided up between a greater number of combustion events, so each event does less work, produces less heat, and combustion chamber pressure is reduced. In addition, the oil pump is able to maintain accurate oil pressure, and scavenge oil from the crankcase better. All in all, a happy engine. So wind that bagger! Rev that trike! They’ll love you for it. This photo was sent to the S&S Tech Department. It shows the top ring land starting to bend upward below the valve pocket. Notice the gap above the top ring. In this case the thin land between the top and second ring also shows some damage. The beginning of the end! The ring land is thinnest just below the valve pocket. Being thin, this area is the weakest, gets the hottest, and tends to break off when detonation occurs, as shown here. 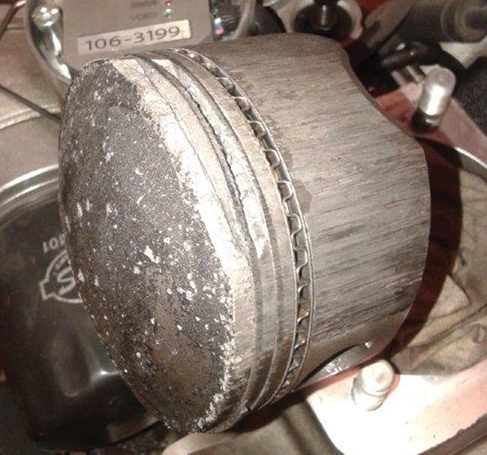 The rider obviously shut it down quickly, since there is only minimal damage where the piston hammered the fragments against the top of the combustion chamber. Resist the temptation to limp it home. When something like this happens, shut it off!